William Hill Poker is one of the most popular websites of its kind, which undoubtedly makes it worth our attention – but yours as well. Today, we are reviewing it by looking more closely at its various aspects, including bonuses, games, tournaments, payment methods and so much more. To get a quick idea of what we think about it, check out the ranking table below! $10 Cash tickets, $100 Cash bonus, and 10 free spins upon first deposit. William Hill Poker has a decent welcome bonus in place for its new players. It is not as high compared to some of its competitors, but it is more than enough to get you started. Once you register on the William Hill Poker website and make your first deposit of any amount, you will become eligible for the welcome offer. This offer is comprised of $10 in cash tickets ($7 Cash game ticket and a $3 Tournament ticket) and $100 in bonus money, plus 10 bonus spins. You can use the $7 cash game ticket on any cash table, be it at regular tables, or speed tables if you’re looking for a kick of adrenaline. The $3 tournament tickets comprise of 4 tickets in total which you can use on different Twister and Sit & Go’s. The $100 in cash bonus can be redeemed in increments of $5 by collecting WH points. The first $10 of the bonus will be redeemed in increments of $5 for every 280 WH points, while the other $90 require you to collect 350 WH points for every $5. William Hill has built its name by having one of the largest poker networks in the world and one of the best selection of poker games. By visiting one of its numerous cash game tables, you can test your skills in Texas Hold’em poker, all forms of Stud Poker, Omaha, and Omaha Hi-Lo. In case you’re the kind of person who likes to slowly work their way toward success, you can participate in one of the numerous William Hill Poker tournaments. The choice of guaranteed tournaments is massive, and so is the prize pool, going as high as 250k. On top of these guaranteed events, you can also enter qualifying events for the European Poker Tour or the World Series of Poker, if you think you are ready to play with the serious guys. 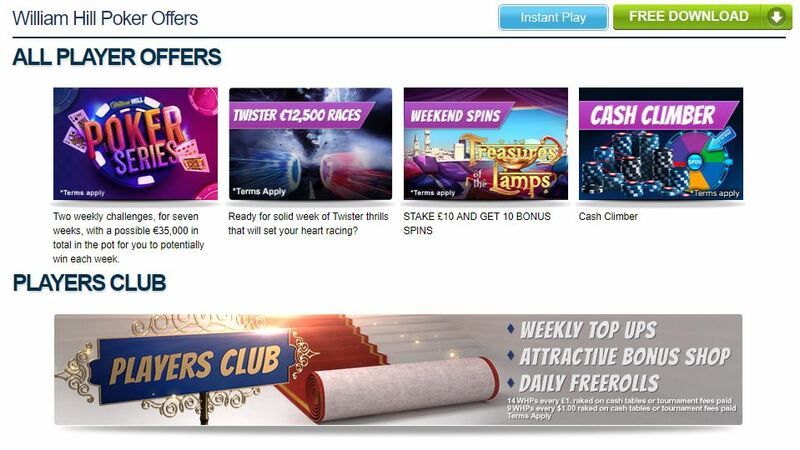 William Hill is a member of the iPoker network, so it offers numerous daily, weekly, and monthly high-stakes events, with lucrative prizes, including Twisters, Sit & Go’s, and a lot more. Apart from the lucrative and complex welcome bonus, William Hill Poker has other exciting promotions as well, for all of its most loyal players. The two most notable ones at this time are the Cash Climber and the Loyalty Club. The Cash Climber requires you to complete 10 poker challenges and 10 slot games tasks each week, for a chance to win a maximum of $1,000. Each accomplished challenge lets you spin the prize wheel, so keep your fingers crossed for a big prize. In order to enter the William Hill Poker Loyalty Club, all you need is to register. After that, by playing, you will be collecting William Hill (WH) points and Club Points (CP). Collecting points lets you climb the club ladder and exchange them for some lucrative prizes. There are two ways in which you can play William Hill Poker – You can either download their client or play instantly in your browser. The software runs very smoothly and it is frequently updated and improved, so we recommend it for the best experience. If you do not want to download it from the website and install it, you can use Instant play instead. It runs smoothly on all the most popular web browsers and supports all of the features. The graphics are not the most impressive in the industry, they appear a bit simple and crude. However, the sound effects and the animations are pretty decent. You can also play on the dedicated mobile app. The maximum amount you can deposit differs from one method to another, ranging from $200 to $100,000. However, the average amount is around $10,000. The withdrawal time is from 1 day for e-wallets, to 3-5 days for other methods. User reviews online generally state that the customer support team is helpful, polite, and patient. Of course, there are some negative comments of unsatisfied customers but the overall impression you get from the majority of reviews is quite positive. All in all, we believe that William Hill Poker is a trustworthy website, with a decent selection of poker games and tournaments. Don’t forget the multi-layered welcome bonus of $10 in cash tickets, $100 in cash, and 10 free spins! If you are looking for a poker provider with a decent reputation and a long history in the gambling industry, you should definitely give William Hill a try. When registering, make sure to do so by entering the William Hill promo code, which will give you lots of additional benefits!